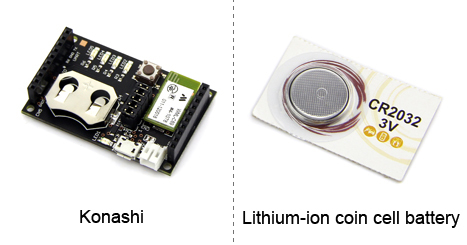 Konashi is a microcontroller board with a Bluetooth Low Energy (BLE) module. It is a physical computing toolkit for artists, designers and engineers who are imagining a next-generation human interface for iOS devices and tablets. It has 8 digital input/output pins (2 of which can be used for I2C communication. All 8 pins can be used as PWM outputs. ), 3analog input/output pins, and 1 UART. 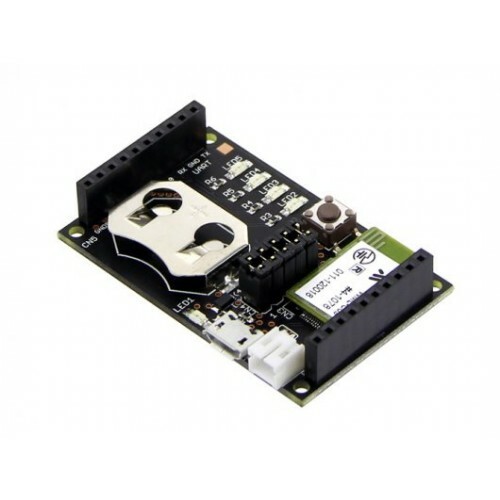 It contains everything needed for physical computing; simply connect it to smartphones and tablets with BLE wireless connection to get started. “Konashi” is a traditional Japanese sweet which makers learn to make. We chose the name for all electronics hobbyists who want to take their first step into physical computing. • SDK (Konashi-ios-sdk) is provided as an open source library. • SDK (konashi-js-sdk, konashi-bridge.js) are provided as open source libraries. • For easier use, konashi.js is available in APP Store (see http://konashi/ux-xu.com/kjs/). • A battery terminal and USB-microB connector are called External main supply. It has a backflow prevention function and swithes a main supply into higher voltage source automatically. • Supply voltage from lithium-ion coin cell battery. • Click to download Konashi Circuit Diagram and Layout . • We have published all documents about the software library at the konashi official website.